The lovable alien isn't so lovable. The Internet is all abuzz with a video featuring America's favorite alien character from the 1980s: Alf. 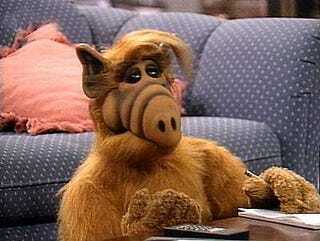 The video, which is essentially a blooper's reel, shows an Alf we never imagined. The Alf character in this video, which is now viral, makes crass comments, is a potty mouth, makes sexual advances toward his co-star and even pretends to snort cocaine. In what looks like a case of Tourette's syndrome, the "lovable" and "playful" Alf fires off the n-word (4:44 in), cuss words and sexually explicit language. We're not sure why people are up in arms over a fake television character using the n-word, since actual people who should know better use it: Dr. Laura, any number of rappers, Michael Richards, Jennifer Lopez. We could go on, but we'll stop. We guess there needs to be another "n-word" controversy, so here it is — and just in time for the holidays. Keeping you in the loop and keeping it moving at The Root.